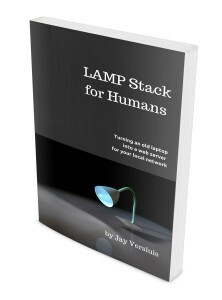 Did I mention that my book LAMP Stack for Humans is also available in paperback format? Actually it has been for several months now, and it slipped my mind to share this news with you. LIfe’s just too busy I guess. Amazon are kind enough to offer it alongside the Kindle edition, so if you want a printed and nicely bound guide on how to build your own LAMP stack, here you go. The printed version is a lovely 6 x 9″ (15 x 23cm) large book with matte finish, about 1″ thick and weighs about a pound (413g to be exact). Printed with love in South Carolina as soon as you order it. Why did it take so long for the paperback to see the light of day? Good question. I had always envisioned both a printed and an e-book version of the book. Here’s what happened. The Kindle edition has been available since early 2015. Back then, Amazon’s KDP service (Kindle Direct Publishing) was not as sophisticated as it is today. They had only recently bought a print-on-demand company called CreateSpace, and if you wanted both a Kindle Edition and a printed version, you had to submit two separate projects to two different websites. Then of course I got seriously ill and couldn’t really think straight – but as soon I recovered, I got on with preparing the printed version. This means a bit of text re-formatting, and of course building a brand new cover. 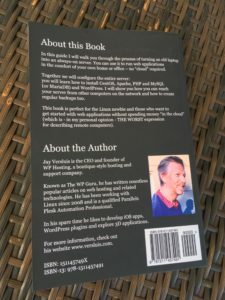 For the Kindle Edition, we only needed to prepare a front page, but that had to be extended to include the spine and the back for the printed version. Today it’s easy enough to either start a paperback directly at CreateSpace, and have them make a Kindle Edition while you’re at it, or start a project on KDP and they offer to also release a printed version via CreateSpace for you. So it’ll be much easier when my next book is released on the 4th of July (Broken Bowels – pre-orders are already open). 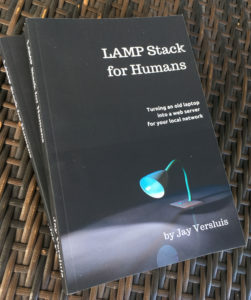 I’m currently offering a FREE SIGNED COPY of LAMP Stack for Humans for Patreon supporters offering $25 or more. Head over to my Patreon page now and support all my creative efforts. You’ll get all kinds of other goodies too, like free web hosting and your name in the credits of upcoming YouTube videos.